Information on AM - A.P.P.L.E. 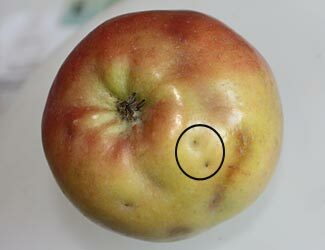 The apple maggot is native to eastern North America, but was detected in western United States in the late 70s / early 80s. Within a few decades, it has spread and established itself in 6 different states, including Washington, Oregon, Idaho, California, Colorado, and Utah. 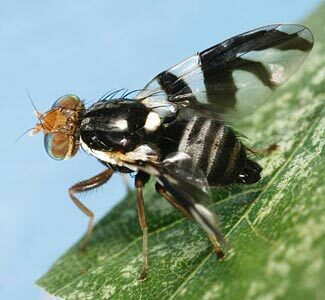 This pest has cost millions of dollars annually in damaged fruit in the apple industry and has been difficult to manage. 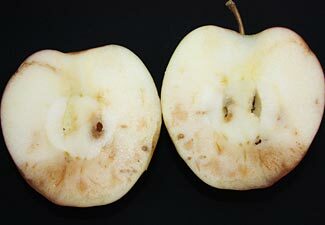 Currently, the only remaining commercial apple-producing regions in North America where the apple maggot is not established are the Okanagan-Similkameen-Shuswap-Thompson Valleys of BC. Identification - Larvae are white, legless, maggot-like with no distinct head and can grow to 6.5 - 8 mm in length when mature (Fig. 1). 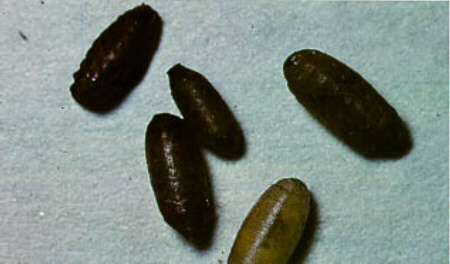 Pupae are gold to brown in colour, oval shaped, and about 5 mm long (Fig. 2). Adults have a black body with yellowish legs and a yellowish head with green eyes (Fig. 3). They are about 5 mm long, which is slightly smaller than a house fly. 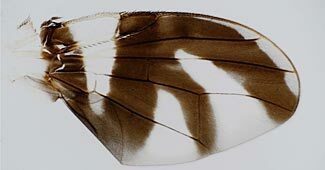 The wing pattern has distinct black bands in the form of an ‘F’, which is the key to identify this species among its relatives (Fig. 4). 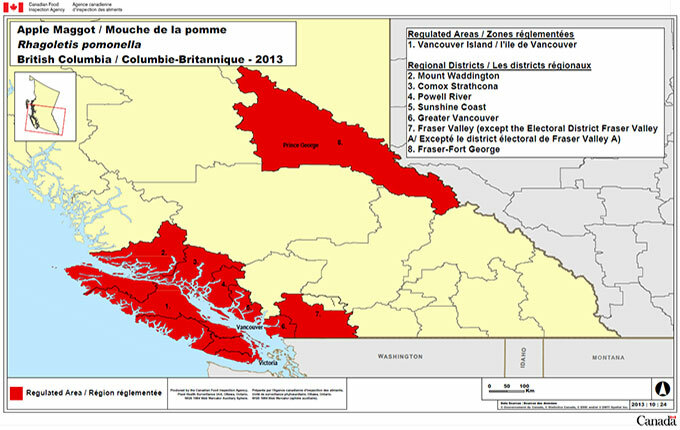 Range - Its range include most of Mexico, USA, and Canada, including the coastal areas of BC. It was first detected in the Fraser Valley in 2006, and as of 2014 has yet to be detected in the BC interior, including the Similkameen, Creston valleys, and the Okanagan (Fig. 5). However, it is only a matter of time before the apple maggot makes its way into the Okanagan. 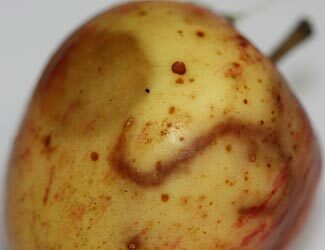 UPDATE: Apple maggot has been detected in the Okanagan - check out the 'AM in the Okanagan' page for more details. Figure 5. Map of apple maggot range in B.C. Hosts - Primary hosts are apple (Malus spp) and hawthorn (Crataegus spp), other hosts include, but not limited to: sweet cherry (Prunus avium), sour cherry (Prunus cerasus), crabapple, Asian and common pear, European plum, bitter cherry (Prunus emarginata), and cotoneaster (Cotoneaster spp.). Life Cycle - The apple maggot only has one generation per year. Eggs are laid singly under the skin of the fruit and hatch in 3 - 7 days. The hatched larvae (maggots) burrow through and eat the fruit before maturing in 13 - 50 days (dependent on temperature). Matured larvae leave the fruit, usually after the fruit drops to the ground, and burrows into the soil to overwinter as pupae under host trees. Adults emerge in late June to early July, and continue to emerge until early October. Some may not even emerge for 2 - 3 years. Adults require 7 - 10 days to feed (aphid honeydew, bird droppings, among other exudates) and become sexually mature before reproducing. Mature females are attracted to ripening fruit to lay eggs, and will move between host trees as the fruit ripens. Over its mature adult lifespan of 2 - 4 weeks, a female can lay a total of up to 500 eggs, with each egg on a separate fruit. *Please note that the apple maggot lifecycle described above is based on data from Washington State, but should be very similar to that of future populations in the Okanagan Region. Damage - Females oviposit their eggs under the skin of the fruit, causing small dimples and depressions (Fig. 6). Early season infestation of fruit will cause bumpy, mature fruit. 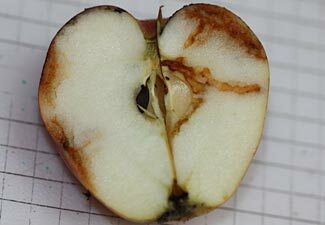 Larval damage appear as distinct brown tunnels through the flesh of the fruit (Fig. 7 - 8). Heavy infestation can lead to mushy, rotted, and premature drop of fruit (Fig. 9). Brunner, J.F. 1987. 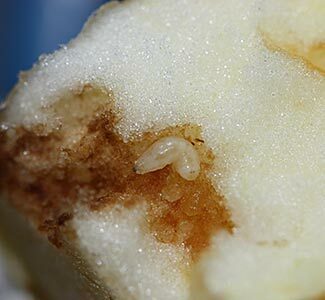 Apple maggot in Washington state: a review with special reference to its status in other western states. Melanderia, 45, 33-51. Bush, M.R., Klaus, M., Antonelli, A., and Daniels, C. (2005). Protecting backyard apple trees from apple maggot. Extension Bulletin 1928, Washington State University. Figure 4 - http://www.agf.gov.bc.ca/cropprot/tfipm/applemaggot.htm - Photo Credits: Naomi DeLury, Howard Thistlewood , Michael Weis, and Jacqueline Sztepanacz, Agriculture & Agri-Food Canada, Pacific Agri-Food Research Centre, Summerland.